The U.S. Chemical Safety and Hazard Investigation Board (CSB) released its final report* on the August 2012 fire at the Chevron refinery in Richmond, CA caused by a leaking pipe. In the discussion around the CSB’s interim incident report (see our April 16, 2013 post) the agency’s chairman said Chevron’s safety culture (SC) appeared to be a factor in the incident. This post focuses on the final report findings related to the refinery’s SC. We like the CSB. They’re straight shooters and don’t mince words. While we are not big fans of SC surveys, the CSB’s analysis of Chevron’s SC surveys appears to show a deteriorating SC between 2008 and 2010. Chevron says they agree with some CSB findings however Chevron believes “the CSB has presented an inaccurate depiction of the Richmond Refinery’s current process safety culture.” Chevron says “In a third-party survey commissioned by Contra Costa County, when asked whether they feel free to use Stop Work Authority during any work activity, 93 percent of Chevron refinery workers responded favorably. The overall results for the process safety survey exceeded the survey taker’s benchmark for North American refineries.”** Who owns the truth here? The CSB? Chevron? Both? As an aside, the CSB report referenced a 2010 study**** that found a sample of oil and gas workers directly intervened in only about 2 out of 5 of the unsafe acts they observed on the job. How diligent are you and your colleagues about calling out safety problems? 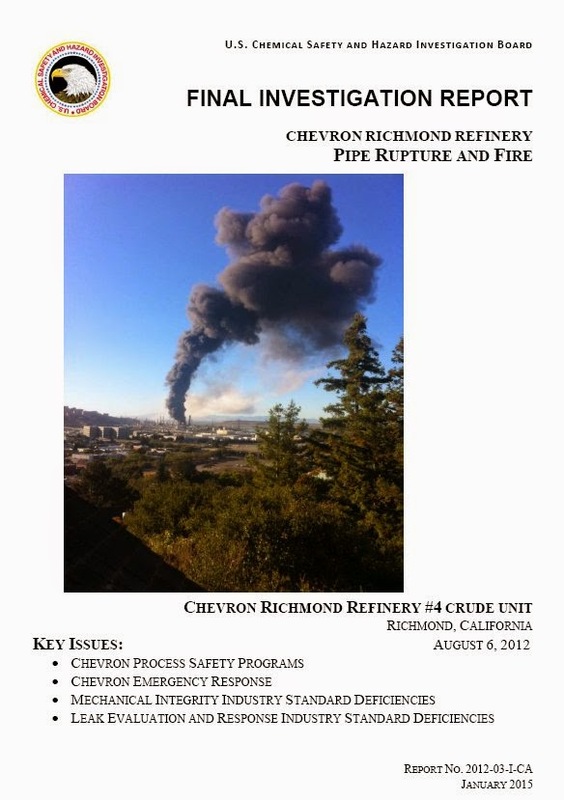 * CSB, “Final Investigation Report Chevron Richmond Refinery Pipe Rupture and Fire,” Report No. 2012-03-I-CA (Jan. 2015). ** M. Aldax, “Survey finds Richmond Refinery safety culture strong,” Richmond Standard (Jan. 29, 2015). Retrieved Jan. 29, 2015. The Richmond Standard is a website published by Chevron Richmond. *** C. Jones, “Chevron’s $3 million backfires in Richmond election,” SFGate (Nov. 5, 2014). Retrieved Jan. 29, 2015. **** R.D. Ragain, P. Ragain, Mike Allen and Michael Allen, “Study: Employees intervene in only 2 of 5 observed unsafe acts,” Drilling Contractor (Jan./Feb. 2011). Retrieved Jan. 29, 2015. A 2013 IAEA conference focused on the concept of Defense in Depth (DID) and its implementation at nuclear facilities. It was a large-scale event with almost 50 presentations and papers. The published proceedings* run over 350 pages. This post focuses on the treatment of safety culture (SC) by the authors and presenters. The proceedings started off well: SC was explicitly mentioned as a cross-cutting issue in the implementation of DID. (p. 1) In addition, the conference itself was predicated on Fukushima lessons learned which, as everyone now knows, included SC shortcomings in both licensee and government organizations. But on the whole the treatment of SC was something of a disappointment. The presentations from Argentina, Pakistan and Vietnam mentioned SC in passing. The presentation from Egypt discussed the regulator’s role in SC oversight at length. (pp. 302-304) Only the following three presentations gave SC a featured role. Two papers discussed SC at different nuclear facilities in Indonesia. Desirable SC characteristics at both facilities were based on INSAG-4. The abstract of this paper*** highlighted SC’s role at this facility. “The application of safety culture in a nuclear facility is one way of DID implementation. Safety culture aims at the performance of safe works, the prevention of deviation, and the accomplishment of quality operation. It is in accordance with the first level of DID concept which is the prevention of abnormal operation and failures that is done through conservative design and high quality in construction and operation. . . The objective of safety culture implementation in the EFEI is to encourage workers to have a stronger sense of responsibility on safety and to contribute actively for its development” The paper presented a laundry list of strategies used to strengthen SC including briefings, workshops, training, senior management visits, integration of safety into work processes, self-assessments, open reporting on safety incidents, open and timely reporting to the regulator, evaluation of safety performance indicators and an annual SC questionnaire. This paper**** reported the findings of a SC self-assessment. The method consisted of questionnaire responses reviewed by experts. The assessment identified several good current practices in maintaining the safety status of Kartini reactor. As supporting evidence, the authors noted the number of inspection/audit findings from the regulator went down while reactor utilization and operating hours increased over the past several years. One opportunity for improvement was the need for more frequent dialogues between employees and managers. There is not much SC substance here. The recitations on SC repeated familiar stuff you’ve seen in lots of places. In other words, zero new information or insight. The single page WANO presentation indicates their lowest common denominator audience is even lower than IAEA’s. Perhaps there were technical issues discussed at the conference that are of interest to you. Otherwise, don’t invest your coffee break in going through this lengthy document. 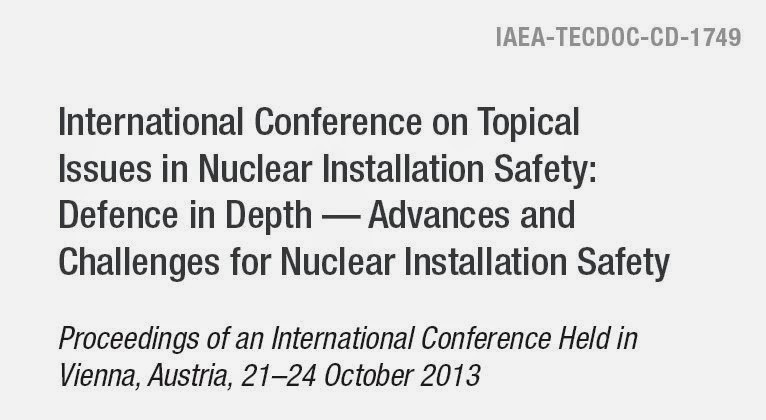 * IAEA, International Conference on TopicalIssues in Nuclear Installation Safety: Defence in Depth — Advances andChallenges for Nuclear Installation Safety, Oct. 21-24, 2013 ConferenceProceedings, IAEA-TECDOC-CD-1749 (Vienna, 2014). We are grateful to Madalina Tronea for publicizing this material. Dr. Tronea is the founder and moderator of the LinkedIn Nuclear Safety Culture forum. ** J. Regaldo, “WANO Actions to Reinforce the Operators’ Safety Culture Worldwide,” p. 147. *** H. Hardiyanti, B. Herutomo and G. K. Suryaman, “Safety Culture as a Pillar of Defense-in-Depth Implementation at the Experimental Fuel Element Installation, Batan, Indonesia,” pp. 173-188. **** S. Syarip, “Safety Management and Safety Culture Self Assessment of Kartini Research Reactor,” pp. 321-326. 2015 is off to a slow start in the safety culture (SC) space but we recently saw two mid-2014 articles worth a few words: “Putting People in the Mix” Parts I and II by Ken Ellis, both originally published in Nuclear Engineering International. * The basic premise is that an incident investigation finding of human error is only “the tip of the iceberg” in understanding human performance issues. 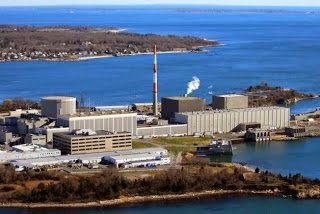 Part I describes how people add a probabilistic aspect to nuclear plant performance. Ellis begins by reviewing the nuclear industry’s defense-in-depth: physical barriers, safety systems and contingency plans. If an incident occurs, then linear root cause analysis starts with the outcome and works back to identify what happened. Lessons learned are used to update the defense-in-depth system. But people don’t always behave according to the laws of physics. People “can circumvent both equipment and process, either unwittingly or wittingly” because of their personal history, perceptions, stress and other factors. Adding people makes a complicated system (a nuclear plant) a complex one. One consequence is that a complete and accurate reconstruction of the events preceding an incident may not be possible. Incident analysis should include investigating the dynamic context in which any relevant human behavior occurred. Ellis on goes to list practices that can help improve safety including communication protocols, conservative decision-making and a questioning attitude. He concludes with some suggestions for managing human performance risk including explicit discussion of complexity and risk boundaries, seeking divergent opinions and understanding how workers interpret messages from corporate. There is really nothing wrong with these articles. Ellis covers the ground fairly well in 2400 words intended for a general nuclear industry audience. But there is nothing new here. More importantly, this is a brisk treatment of some important concepts about human behavior, the nature of human and system errors, competing mental models of nuclear operations, and desirable management attributes. The author’s lack of references means a curious reader is left to his own devices. One really needs direction to key sources, e.g., Dekker, Hollnagel, Reason, Taleb, Vaughan, Woods and the HRO people to gain a meaningful understanding of such concepts. If you’ve been following Safetymatters for awhile, you know we’ve covered these folks and their ideas at length. * K. Ellis, “Putting People in the Mix: Part I,” Nuclear Engineering International (July 18, 2014) and “Putting People in the Mix:Part II,” Nuclear Engineering International (July 21, 2014). Mr. Ellis is the Managing Director of the World Association of Nuclear Operators (WANO). Thanks to Dr. W.R. Corcoran for publicizing Part I in the LinkedIn Nuclear Safety Culture group.